Mixed with an equal part of Mineral Spirits, Refined Linseed Oil makes for an excellent general painting medium, adding flow to stiff paint. Gamblin’s Refined Linseed Oil is pressed from American flax seeds and refined using an alkalai process. This low acid oil is about as light and pure as it gets. 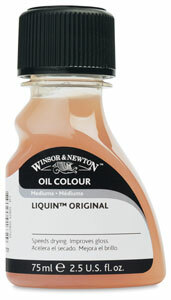 Use linseed oil to thin oil colors and increase their brilliance and transparency. When combined with the right mix of turpentine and damar varnish, this mixture becomes Mayer’s Medium, which is one of my favorite for oil painting. I prefer Galkyd for glazing techniques, when I’m not using a traditional medium, or need a fast-drying alkyd alternative. While I don’t use this often, when I need a fast-drying alkyd based medium, this works well. I’ve heard that it will discolor if you use too much medium in your pigment, but I have not seen that first hand. When I use this it is typically in “Duck Sauce” fashion (1/2 Liquin Original and 1/2 Mineral Spirits). That makes for a very fast, slippery medium for quick plein air painting.